So our friends at Transportation Alternatives walked alongside a 14th Street bus yesterday — and the bus won by just five seconds, as Gothamist reported. The goal was to show that 14th Street still needs a dedicated bus lane and car-free conditions that were promised as a mitigation during the now-scrubbed L-train shutdown. The lousy bus service on 14th Street persists even without the shutdown, so why not solve the problem? Too bad the activists picked a school vacation week to prove their point. They would have easily beaten the bus in normal traffic. Mayor de Blasio will make his loooong-awaited announcement about placard abuse today at 2:30 p.m. Aaron Naparstek offered a possible preview. Some of the many public advocate candidates debated on NY1. It’s archived here. Earlier in the day, StreetsPAC endorsed Melissa Mark-Viverito. Check Streetsblog later for the candidates’ responses to our street safety questionnaires! The de Blasio administration lied to FEMA in 2014 … to get more city cars! (NYDN, NY Times) Meanwhile, the Post joined Streetsblog in noticing that Mayor Vision Zero has a lot more city cars than his predecessor! 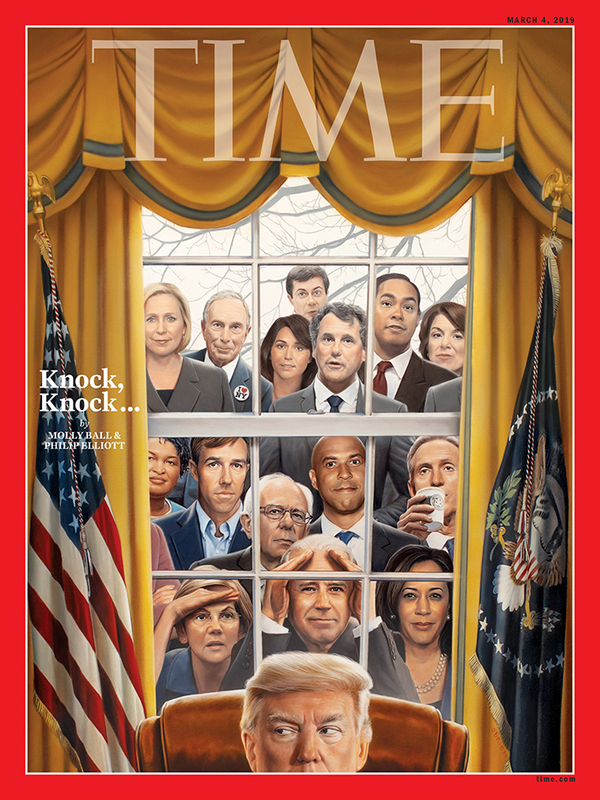 And, finally, we don’t see Mayor de Blasio on Time magazine’s cover of Dem hopefuls. On the way to 100 Democratic candidates, all striving for attention. Will not one of them raise the generational equity issue? When I first realized that a negative trend in the economy and society was being amped up by public policy, the disadvantaged generations were those under age 30. A decade later it was those under age 40. Then those under age 50. And now those under age 60, aside from, I guess, tech tycoons and certain unionized public employees (who got some benefits from screwing those now under 40). And yet this situation is still under Omerta, and most public policy proposals that are advanced would just make it worse. Blame Generation Greed. Blame my generation, Generation Apathy. But the people in the picture? The are just taking advantage of the situation the rest of us have allowed to occur to slither up the greasy pole. Motor vehicle tragedy involving a well known figure in Upstate NY. Re: The FEMA story, yes some of the money was for cars, but it was also used for heavy equipment like street pavers, trash pumps, and commercial vehicles according to the article. Not justifying the fraud at all, but let’s not make it seem like they were just taking more money to add to the fleet just for kicks.